Recently, we had a team day where we took a card in a box and made as many cards from boxes as we could on the day. I managed to make 10 on the day! I was inspired to make this card by SCS here. It’s a gorgeous card, so please check out the link! I altered the colours a little. 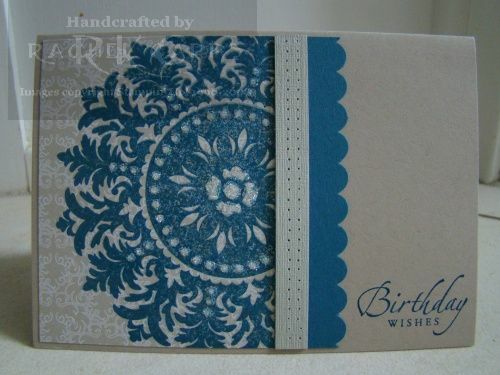 So I used Kraft as the base, Not Quite Navy for the scalloped edge strip, textured Sahara Sand for the paper pierced strip and I stamped the Medallion on Bella Bleu DSP in Not Quite Navy. And I stamped the sentiment from Sincere Salutations in Not Quite Navy. A touch of Dazzling Diamonds and the card is finished! 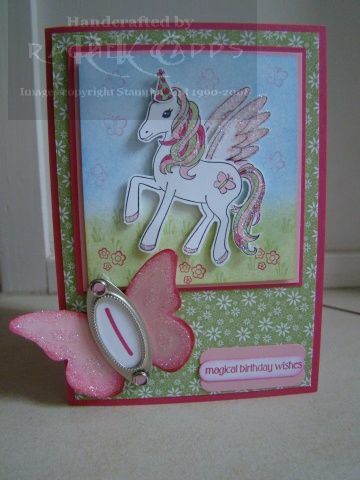 I made it using the new stamp set, Pony Party (available in the Autumn/Winter mini here). I sponged the background with Bashful Blue and the grass with Certainly Celery, using the cute little stamps on the cute backgroud – pink butterflies in the sky and stems and flowers in the grass. 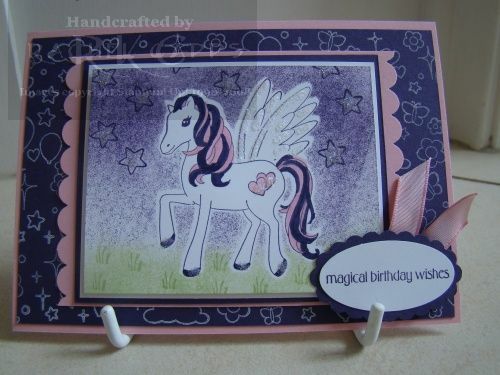 The adorable party pony I’ve cut out was stamped in Staz On black, with a cute party hat and two sparkling wings. I’ve coloured the pony in with Melon Mambo, Pretty in Pink and Certainly Celery. I’m afraid I can’t remember the name of the Certainly Celery DSP, but it is retired. I love these colours together – Melon Mambo, Certainly Celery and Pretty in Pink. I’ve stamped the “1” using Best Friends Numbers (retired) and punched it out and layered it with a butterfly (cut with the Big Shot, but a die unavailable in Australia) and Styled Silver Hodgepodge Hardware. A couple of pink rhinestone brads and Dazzling Diamonds finish it off! Yeah! The Stampin’ Up! BIG SHOT has arrived in Australia!! 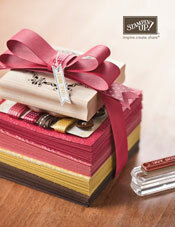 And exclusive dies, and clear-mount rubber stamps, and new style punches, and 3 new In Colors!! I’m sure you already know that the new Autumn/Winter Mini catalogue starts today … and it is FULL of amazing products!! You can check it out here. And check out my specials on the right hand column! This is a card I made as a swap for a recent and lovely training day. I had to have this stamp set from the new Mini … Pony Party! My 5 year old daughter has stamped it more than I have, lol! As I made this card for a swap, I had the chance to play with a few variations. All the swaps were made using the colours Pretty in Pink and Elegant Eggplant. I’ve masked the pony to give a eggplant-night sky. I also masked the wings, twice. 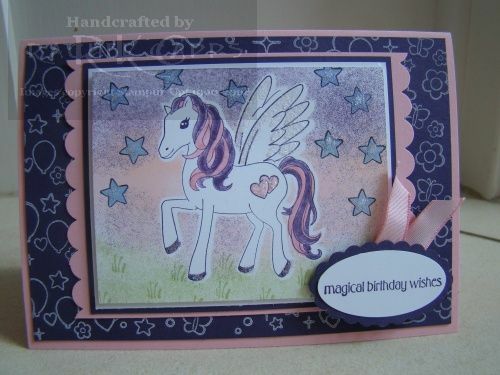 The difference on this card is that I’ve coloured in the pony’s mane with my marker pens. On every card I also used the Dreams coordinating wheel in White Craft ink on the background Elegant Eggplant card stock. The difference on this card is that I’ve coloured in the pony’s mane with my blender pens. I used Dazzling Diamonds on every card too – how can there be no bling on a magical card?!? 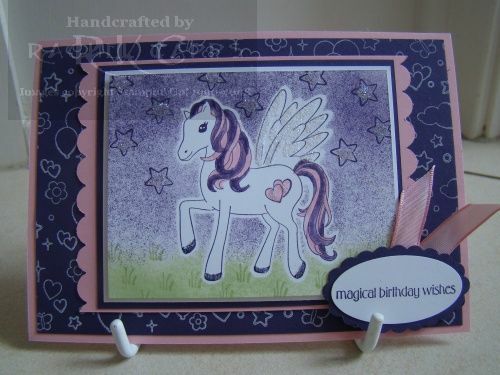 The difference on this card is that I’ve sponged Pretty in Pink in the sky and coloured in the stars with Bashful Blue.